Carol M. Browner, President Barack Obama’s top energy and environmental adviser, plans to leave the White House in the coming weeks, White House officials said Monday night. Browner, who served as Environmental Protection Agency administrator for all eight years under President Bill Clinton, has emerged as one of the most experienced Washington hands in the current West Wing. Her calm, authoritative television presence during last year’s BP oil disaster made her one of the few government officials whose stature was enhanced in the aftermath of the Gulf of Mexico catastrophe. But passage of a comprehensive climate change bill, a career-long goal and the primary mission of her office, collapsed last year and seems unlikely for some time to come with the current House Republican majority. Browner’s departure comes as the West Wing undergoes a heavy makeover, including the arrival of chief of staff William Daley, a rare outsider in the top echelons of the administration. 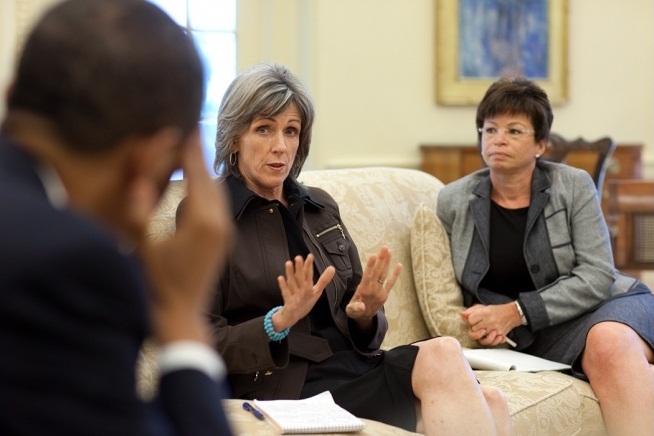 She was among a number of Obama officials in the recent running for a job as deputy chief of staff. But she will instead head for the exits as Obama looks to buff up his business credentials. It’s understandable that this would occur. With a republican House and a pivot to the “centre” personified by the arrival of William Daley in the Chief of Staff position, unattainable policy goals like climate change legislation will be left by the wayside. There really is no conceivable majority for anything that would even remotely reduce CO2 emissions. The republicans are almost unanimously against any CO2 cap, tax or trading scheme, as are scores of industrial state democrats. Unless there is a paradigm shift in American political opinion (or some kind of major ecological disaster), that won’t change any time soon. Even when the democrats had overwhelming majorities in both houses of Congress, they couldn’t get anything through. That’s saying something. It’s a shame and an embarrassment, though. I know that American exceptionalism means the US setting its own rules, marching to the beat of its own drum and whichever other tired clichés one wishes to pull out to illustrate the idea. But really, apart from Australia, which has its own climate-denying far right (Tony Abbott is a sportier, more yobbish Mike Huckabee), there isn’t a single industrialised country that doesn’t understand the need to limit carbon emissions – on the right as much as on the left. Connie Hedegaard, EU Climate Change Commissioner, is a right-wing market liberal from Denmark. Nicolas Sarkozy’s government, which no-one could accuse of being left-wing, has been very strong on environmental issues compared even to many socialist governments in Europe. In the United States, on the other hand, only maybe a third of Congress sees any need to deal with carbon emissions – another third theoretically accepts the notion of man-made climate change, while not wishing to sacrifice jobs in industrial states to do anything about the problem, while the remaining 33% of congresspersons and senators deny any human role whatsoever in global warming. It’s more than a little surreal, and no-one outside America understands it. It’s a combination of religious fundamentalism, know-nothing nativism and political cynicism which means that any global climate deal that attempts to include the United States will inevitably fail – further damaging America’s credibility on the international stage as a result. Certain states, like California, have made major efforts to curb emissions. But unless the most heavily polluting industrial states are forced to play by the same rules – which means federal legislation of some kind – no substantial progress can be made in curbing the USA’s carbon footprint. And while America does nothing, China has no reason to curb its own rapidly-growing CO2 output.